Tilt-To-Load Drum Rotators from Essex Drum Handling - Morse Drum Tumblers power-lift, rotate and tumble steel, fiber and plastic drums corner-over-corner to thoroughly mix contents. Buy Drum Handling Equipment from Essex Drum Handling in NJ! Morse Tilt-To-Load Drum Tumblers power-lift, rotate and tumble steel, fiber and plastic drums "corner-over-corner" to thoroughly mix contents. Avoid material loss from unevenly mixed 55 gallon drums. Morse drum rotators can hold 29" to 37" tall drums that are 18" to 23.5" diameter and mix at a variable speed: 5 to 20 RPM. Order a Morse Drum Tumbler online or call (877) 742-5190 for a custom quote. Morse drum tumblers have the ability to lift and tumble drums "corner-over-corner" to mix 55 gallon drums. 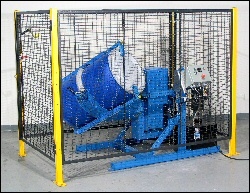 The drum tumbler holds your drum on an angle to rotate the 55 gallon drum with aggressive "corner-over-corner" action to agitate the contents and mix them thoroughly. Mix ingredients directly inside closed 55 gallon drums without exposing workers to harsh chemicals. Morse 55 gallon drum tumblers save time and money. Morse 310 Series Tilt-To-Load Drum Rotators have power-lift, and tumble drum "corner-over-corner" to thoroughly mix contents. The drum tumbler holds your drum on an angle to rotate drum with aggressive "corner-over-corner" action. Motor is 2 HP, 60 Hz. 2 clamps at top of drum and cinch chain around drum. 1. 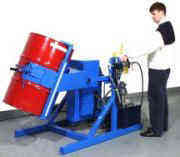 Quickly load upright drum into the Morse drum tumbler at floor level with drum truck, Model 81 Drum Spotter or hoist attachment (Loading with Model 160-WP shown). 2. Using the cinch chain around drum and two top clamp, s ecure your drum in drum rotator. 3. To activate drum tumbler hydraulics turn motor on. Install all Morse Tumblers in accordance with OSHA requirements for enclosure and safety interlock, etc. Drum rotator must automatically turn off when enclosure door is opened. Enclosure with safety interlocks will automatically shut off the drum tumbler when the enclosure is opened. Safety Enclosures with Automatic Control Package allow you to load the drum, close the enclosure, set the rotation time, and walk away. The rotator will automatically lift the drum, rotate for the time you set, then lower the drum to upright at floor-level for easy access.